Make sure you delete/disable any other slither.io userscipts/extensions first! The Slither.io extension is an extension that combines Slither.io Mods and Slither.io Hacks to make the best possible extension for Slither.io, that allows you to play with friends, and has many other cool features. Toogle Snake Skin Rotator [Start or Stop -W] New! DIE Back to main menu [Q] New! ENABLE & DISABLE MOD option New! Toggle HUD – [TAB] New! Reset Zoom – [Tilde] New! The Slither.io mod is a script that modifies the Slither.io (slither io) client that rarely needs updating, and doesn’t contain any cheats. This was originally a Tampermonkey script, but we created an extension for ease of access. If you are feeling a little bit mean, you can choose to take the unfair path and choose to modify your game with hacks or advantages. This way, it is easier for you to win, at the cost of other players! No need to have skill, you just install Slither.io hacks and voila! Easier to see players for example, by zooming out. This way, you see them earlier than they see you, and this gives you an advantage. If you are looking Slither.io Mods “slither io” “slitherio” for modifications of the game, which aid you in playing, but do not give you an unfair advantage, you can check out this category. Here are things such as graphics quality mods, connect with friends mods and background changers and more skins. Without giving you an unfair advantage, they are nice modifications to the game, so check it out! We don’t host our extension on the Chrome Web Store anymore, because they don’t support our amazing features. So for now, you will have to use the userscript. Fantastic blog you have here but I was curious about if you knew of any message boards that cover the same topics discussed here? I cant find download link!!!!!! How do you remove the text that shows keybindings in game….? So how do you remove the text in game that shows keybindings? i try it. ir works on high graphics mode. you can reinstall as userscript. We don’t host our extension on the Chrome Web Store anymore, because they don’t support our new features. so for now, you will have to use the userscript. If you are not install a new version of Slither.io Mods, you can’t use new features. Make sure you have Slither.io Mods v3 and remove all other slither.io script/extensions. All issues fixed. Please clear web browser’s cache and try again. How to clear the Cache? How to add logo and customize your mod? Can you do this on iPad or something like that? mine did not work at all ! This is the best mod for Slither.io!! how to get this mod help! Can i get this without using Chrome? how come the servers do not match if u go on the same one ..
I’ve downloaded chrome, it worked my other computer but it isn’t working on this one. Ugh. for a couple recent versions you all FIXED the zoom out problem on a trackpad. Now with the latest version, the problem has returned. What happened!?! The problem is that on a trackpad, on a pinch to zoom, pinch out to zoom out, that the screen slowly zooms in. It can never stay on one zoom setting! I complained about this before and it was fixed, but now whatever you did has caused it to return. how do you get this app!? The zoom was fine on 2.0.8, now in 2.0.9 we zoom out and it automatically starts going to normal zoom again. how may i turn it off? I can`t use this mod, While installation, this thing write error: “Invalid script header” !!! The map features (including map, scoreboard, your info on how big you are) are really really tiny… how do i fix it so that they are normal size again? After we get to the page greasyfork.org what do we do? Thx! How do I manual download the link? Where do I put the text at? can anyone see ur skin changing? i have a laptop . how do i zoom innn !! how to zoom out n in? Just press the download then add to chrome button. Do people in the game see your skin changing??? How do I install it to Firefox? Can I install it to Firefox? A dialog will appear to show you data that the extension will be able to access. Can someone tell me how to download this please??? Several times I get a score that has me on the leaderboard. However for some reason if using this program, it has me on the leaderboard with no name next to it. I of course want to have my name entered on the leaderboard in big for all to see. This is really annoying. Does it happen just to me or everyone else too? do people in game see your skin changing? I Need Help Do I Have To Install Slither.io? Make sure you disable any other slither.io extension and scripts first! You don’t need any other mods or tampermonkey with extension. love the mods but confused …if we install the chrome extension . do we still have to install it to tampermonkey? thats where i’m lost. 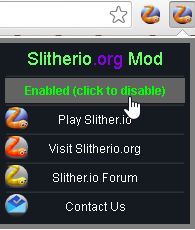 Make sure you disable any other slither.io extension and scripts first. And you don’t need tampermonkey. I downloaded this mod but i don’t know how to use it, could someone help me? How to usee this extension . just download it and add the extension done ? Can you add a toggle for this to turn on/off the bot mode, during the same gameplay? How do we toggle the bot? I thought this combined the hack & mods. Can we add a feature to toggle the bot on and off during gameplay? ESC stopped working on today’s update, also the smaller “Play” button does nothing. Fixed, update should be pushed in a minute. oh no! tilde isn’t working ! and …yes! the auto opening tab was a little weird! Great update. Just don’t cause it to open a new slitherio window when it updates next time please. That was annoying. Hello! I have a request. You see, the scroll wheel of my mouse is broken and because of that i can’t use the zoom out feature. Would you guys be willing to program a way to zoom in and out with the keyboard?